The Angel is the first truly comfortable 4-inch stiletto heel. It is the flagship shoe of the Signature Collection and is, in many ways, the perfect pump. Ten years of merging old-world Italian shoemaking with cutting edge technology and structural design has gone into this shoe. When you first slip it on, you expect that crunch in the toes, pressure at the ball of the foot, or strain at the arch typical of high heels, but it’s just not there. A picture may be worth a thousand words, but in this case, you have to try it on to believe it. Every woman deserves to look and feel this good. Anyi talks about the Signature line, its features, and why women deserve a comfortable 4-inch heel. We’ve pinpointed the three areas of high heel shoes that traditionally cause pain and physical harm–the first of which is a tight, uncushioned toe box. With a supported arch and a balanced heel, we’ve managed to distribute the weight more evenly across the entire footbed, not just jammed at the front. Additionally, we’ve created a customized platform made up of over an inch of space-age polymer material for memory cushioning and shock-absorption. These polymers are flexible, feather-light, and supportive. The outsole is textured to prevent slippage and provide further buoyancy with each and every step. 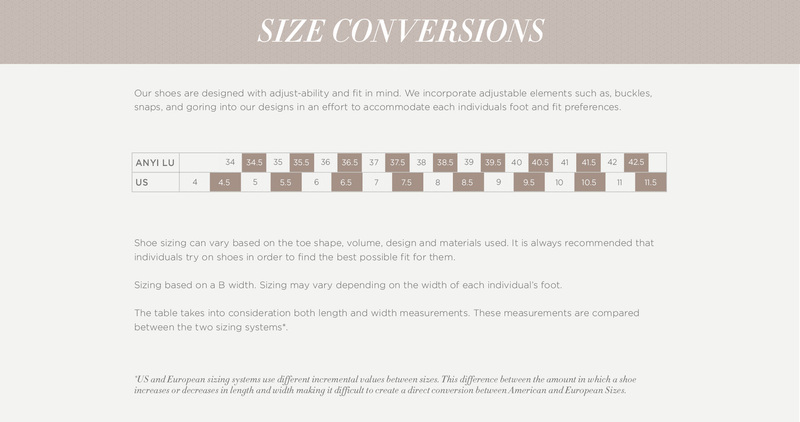 Our well-designed toe box allows all your toes the room to move independently in your shoes. The second area of high heel shoes that can cause pain and damage to the body is an unsupported arch. Typically, the center of the foot floats in a high heel shoe pushing all the weight into the toe box and putting undue pressure on the tendons and ligaments along the base of the foot. We’ve created a cushioned, arch-supported footbed, which not only prevents foot fatigue but helps keep the body aligned after hours on your feet. The insole is lined with advanced polyurethane memory foam, a material specifically developed for NASA for impact cushioning. Often, the heels of high-heel shoes do more harm than good. They are flimsy, unbalanced and placed too far back to hold any actual weight. This causes the body to slide forward, throwing it completely out of alignment and leaving it susceptible to injury. Our heel is balanced perfectly to keep your weight centered and aligned properly. It lets you move with confidence and freedom.